The Trump administration is celebrating a 90-day truce in its trade war with China—even though skeptics believe that Beijing won’t yield to U.S. demands anytime soon. During talks in Buenos Aires, Trump agreed to delay a January 1 increase in U.S. tariffs on many Chinese goods for 90 days. Instead, the two sides will negotiate over U.S. complaints about China’s trade practices, especially that China uses doubtful tactics to try to achieve technology supremacy. Not that the Asia giant doesn’t have plenty of ideas of its own. The United Nations announced this week that for the eighth straight year, China has issued the most international patent applications—documents giving someone the right to keep other people from making, selling, or importing an invention. Many analysts are relieved that the Trump-Xi meeting at least pressed the “pause” button on tariff hikes. Most believed such tariffs would have raised prices in the United States on many items, including smartphones, clothes, and toys. 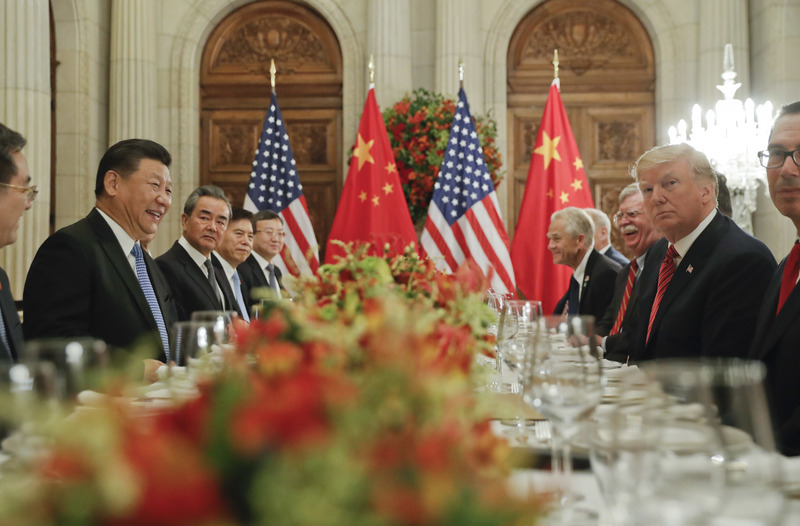 In return for delaying higher U.S. tariffs, China agrees to increase purchases of U.S. farm, energy, and industrial goods. But the pledge to buy more American products has been made before. It seems dealing justly and keeping one’s word are in short supply. is trump in china or is President Xi Jingping’s in america? I think its funny how in the picture five people are busting out with laughter but the others are dead serious looking. I hope everything ends well. I hope everything ends well. I am praying for the U.S. and China. I think it is cool that President Trump is meeting with China's leaders and making a peace treaty instead of arguing and fighting. May God bless China and the U.S. I don't think China has a very good name here in the States. I don't think Trump's hurting Americans (except maybe some feelings) in the long run! I think he is definitely helping. My Grandpa lives in a very small town in rural Nebraska. as you would expect, the town and surrounding area are mostly pro republican and my Grandpa himself is a Trump fan. he owns a small tractor and farm equipment store, as well as a small farm. due to the tariffs on agriculture set in place by China in a response to Trump's tariffs, the people in his town (who are primarily farmers) have a lot less money to spend, which means that his business hasn't been doing well. I just thought it was kind of ironic how the people who elected trump are the ones suffering due to his actions. I think in the long run it will be better. In the short run it may mess stuff up. I do sympathize with farmers, however (actually that's pretty funny because my grandpa lives in a rural community in Kansas), and I'm hoping that in the long run things will get better for them.